The course is organised by the professorship of Building Design at Aalto University Department of Architecture, Prof. Pirjo Sanaksenaho. 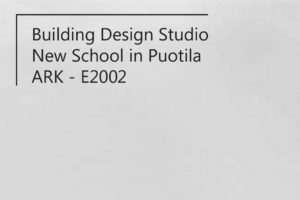 The Building Design Studio task is to design a new elementary school building in Puotila, Helsinki. The assignment allows the student to become acquainted with designing learning environments which support the goals of project-based learning adopted by the Finnish education system. The design task consists of learning space for pre-school students (5-6 year-olds) and elementary school 1.-6. grades. The total floor area of the new building is around 6000m2. The building should reflect the identity of the new pedagogic approach.The alteration from teacher-centered education culture towards learning-centered school environment inevitably transforms the use of the learning spaces. The design studio will explore new ways to provide a holistic and supportive environment to learning. Strong emphasis is put on the innovativeness and architectural quality of the school building as well as the adaptation of the building to the surrounding environment. 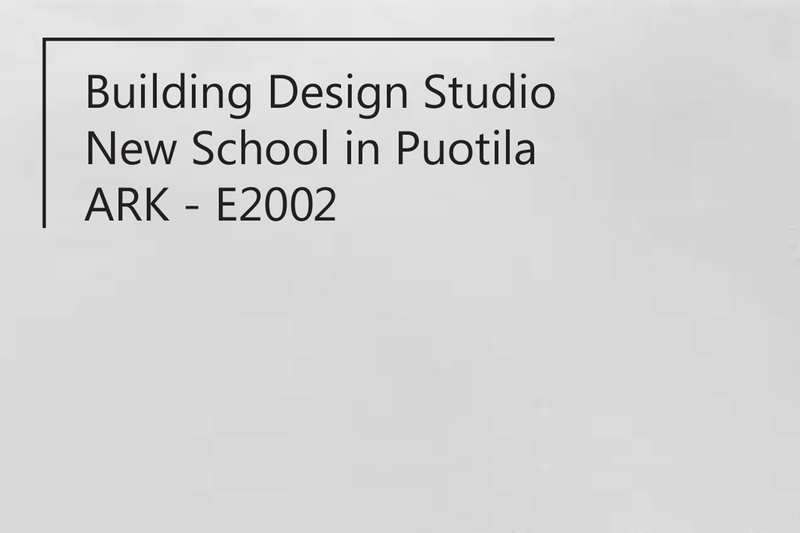 The aim of the course is to develop new learning environments and explore Puotila district as a site for a school building. The main aim of the studio is to teach students how to design a large public building. The emphasis is on the step by step design process leading to the finished work. The course is divided into “camps”, helping to give structure to the design process. Seminars, lectures and tutorials with engineers on technical issues during the design process are an integral part of the course. The lecture program offers background on the new pedagogic approach and its application to spatial solutions, introduces contemporary school architecture in Finnish context and also explores the outdoor spaces as an important part of the learning environment.